Timing is everything in the old car hobby but one of the best forms of timing is to buy in an era when the prices were a lot lower. The type of vehicle is another big factor because a ’71 Saab will never appreciate in value like a ’71 muscle car. 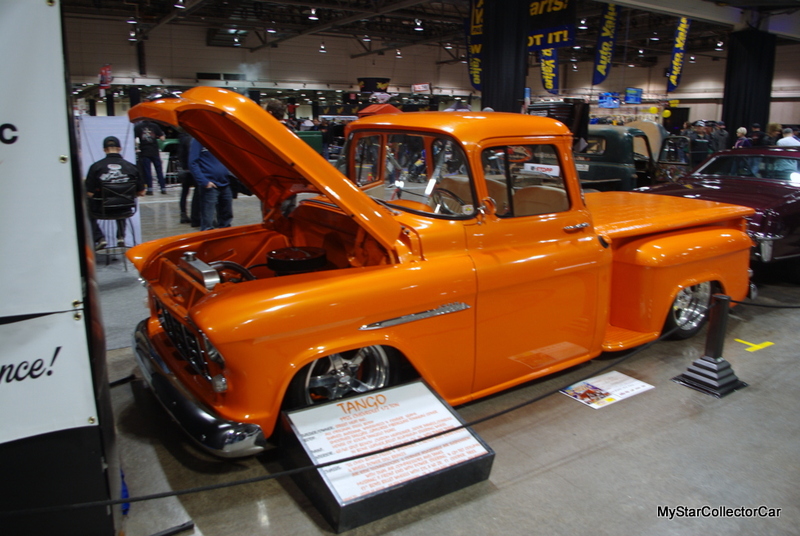 Tri-five (1955-57) Chevy pickups fall well within the category of an upward trend in value so if you were smart enough to buy one back in 1981 you definitely paid a realistic price. 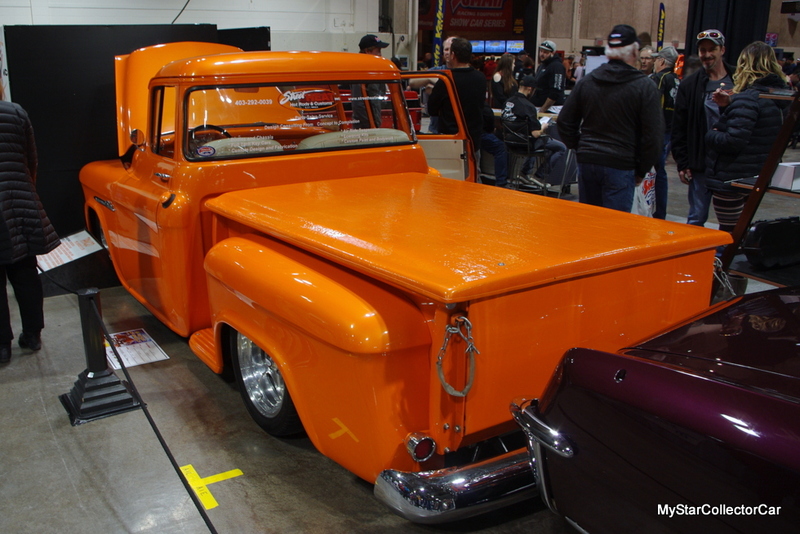 Bill Kerekes was one of those visionary guys because he did buy his ’55 Chevy pickup 37 years ago when it was seen as more of a used old truck than a classic vintage truck. 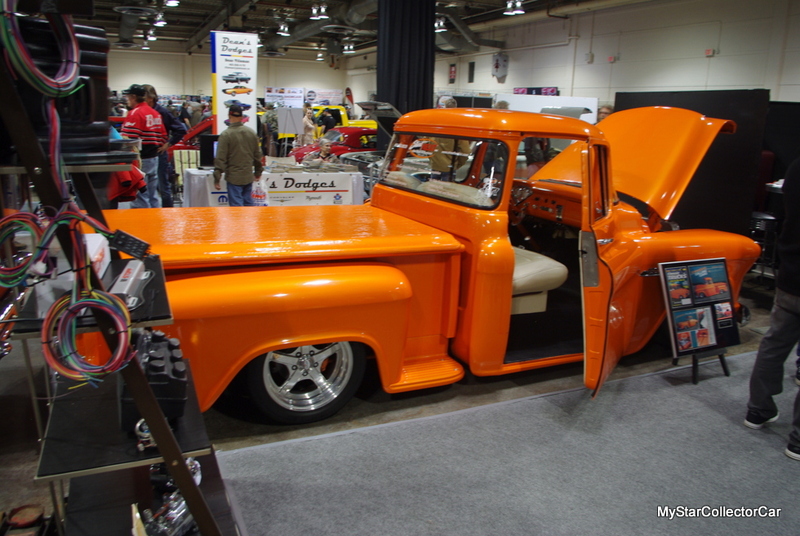 The truck was at the 2018 Calgary World of Wheels show. He found the truck down in Couer d’Alene, Idaho on a dealer’s lot. The previous owner had traded it in for slightly newer truck so Bill “took it around the block, bought it and loaded it up with oil and water and drove it home”. He liked the truck but he wasn’t impressed with the driving experience. He only drove it four or five times because it “was a terrible old truck to drive because it wandered so much”. This was a barebones working truck so it came with the basic 6-cylinder 4-speed manual power train but it ran like a champ on the 400 mile trip home. Bill wanted a little more performance out of the old Chevy so he found a donor from an unusual source—his Mom’s ’68 Olds 455. The car was on its last legs under his brother’s watch so Bill grabbed the car before his brother sent it to the crusher. 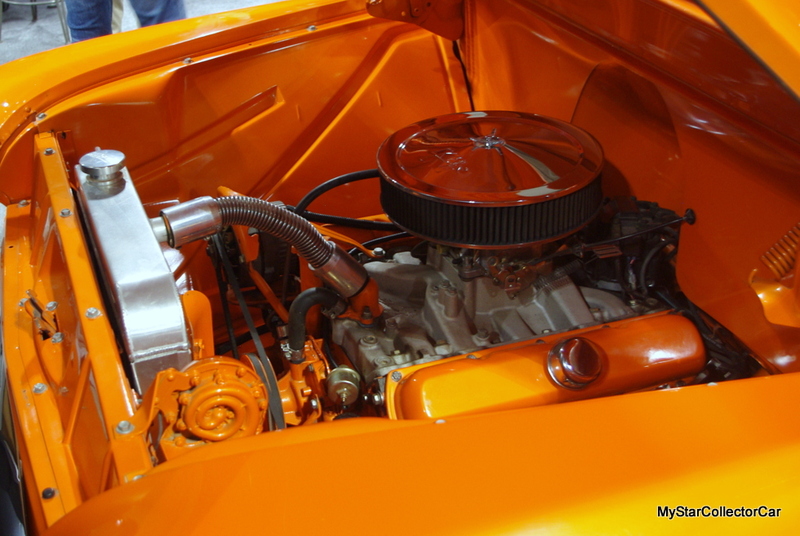 The big block was a great addition to the underpowered Chevy and Bill kept a 100% stock look with the original red paint. The truck went to Bill’s shop where they decided to make it “more of a hot rod” so they lowered it to improve the handling. They ran with this until 1996-97 and that’s when they took this truck to another level. 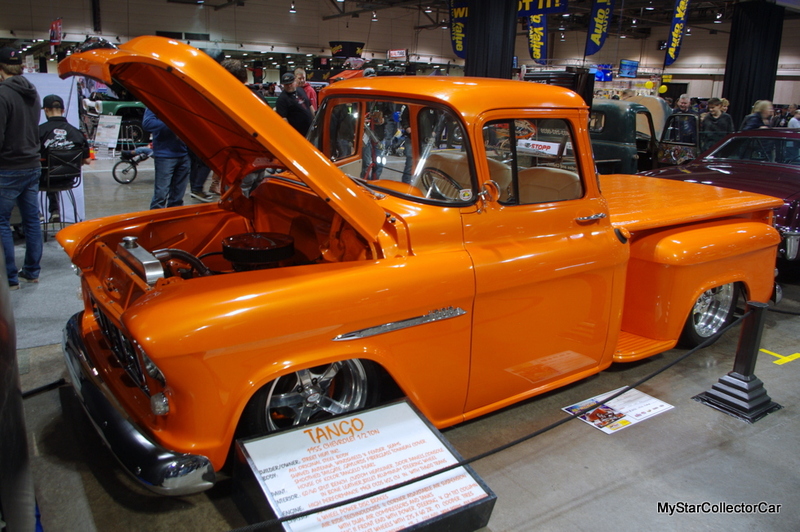 Bill wanted the truck to drive as well as it looks so they worked the 455 up to a new level (380 horsepower at the rear wheels); then they focused on the suspension. The truck went to a Mustang II front end with a 4-link rear end so there is a night and day difference in the driving experience. This was a first class job from Bill’s professional shop and it became a showcase vehicle for the business –so prominent it’s on the company business cards. 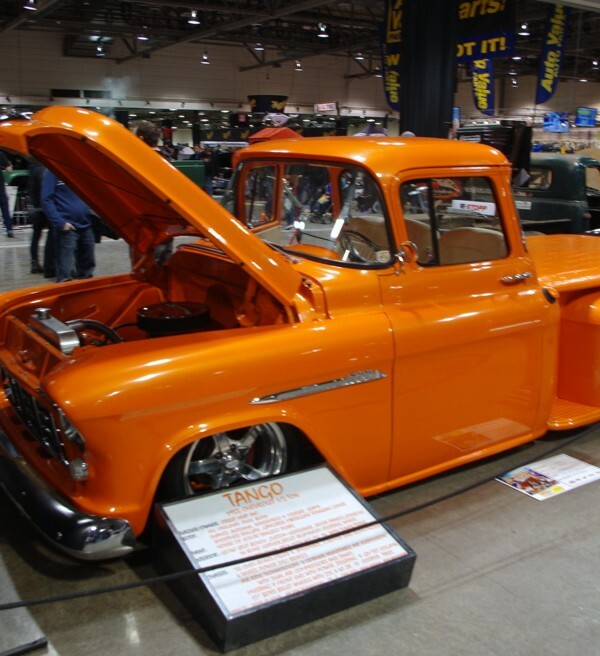 The truck went to its current orange paint twenty years ago—the same paint it wears today. The finish is in remarkably good condition because this is a real world truck. Bill is definitely not afraid of a road trip to shows hundreds of miles away because this ’55 Chevy is rock solid on the long haul. 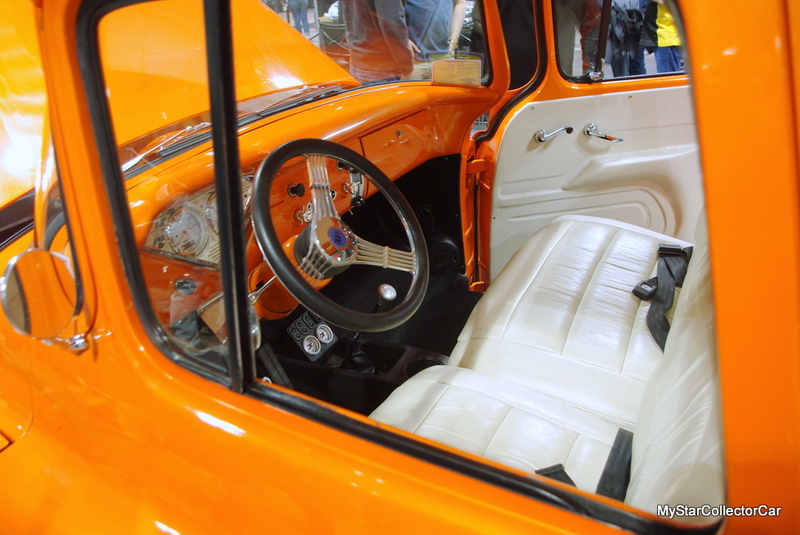 There’s only one real issue with the ’55 Chevy—the gas mileage is brutal. That’s the only downside with Mom’s old motor.